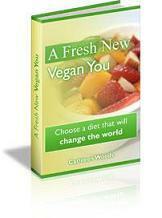 *Ebook Sale: "A Fresh New Vegan You" 25% Off! I love this time of year. Farmers' markets are just starting to sell tomatoes, blackberries, blueberries, and corn. My meals are full of fresh fruits and vegetables and are often eaten out in the sun. Even my little struggling balcony tomato plants are starting to look promising. I hope you are enjoying the warm weather and fresh produce as much as I am. Don't forget that I write this newsletter and produce Vegan-Nutritionista to help you, so if you ever have a suggestion for a topic you want covered in the newsletter, please let me know. I got an email from a friend a few weeks ago asking what I thought about Splenda. She has been having joint pain and major stiffness for a few years, and had been tested for many different serious illnesses, none of which resulted in a positive diagnosis. After waking up with a particularly nasty case of a wrist she couldn't bend, fingers frozen in place, and other pain, she started to wonder if her diet had anything to do with her pain. She typically drinks about 2 Coke Zeros and tons of Crystal Light each day. When she diets, she replaces all regular sugar with Splenda, thinking that because it doesn't have calories, it's better for her. The morning of the frozen wrist, she googled "Splenda and joint pain" and found numerous examples of other people with the exact same symptoms as her. I've been anti-sucralose for a few years, ever since I google-diagnosed my sister's intense headaches as an addiction to Splenda. It took her some time to break the addiction, but she no longer uses Splenda and feels better. I am uneasy when I see anyone adding it to drinks or drinking and eating things that already have Splenda in them. In an effort not to preach about everything food related, I try not to bring up my distaste for Splenda unless asked. Splenda is made from sucralose, a sugar substitute that is 600 times sweeter than sugar. It doesn't have calories, so it's marketed as a diet substitute for sugar. People love sucralose as a sugar substitute because it tastes like sugar and has no aftertaste. However, numerous side effects have been reported from eating and drinking foods made with Splenda such as skin rashes/flushing, panic-like agitation, dizziness and numbness, diarrhea, swelling, muscle aches, join pain and swelling, headaches, intestinal cramping, bladder issues, and stomach pain. Those people also report that once they discontinue eating those products, the symptoms subside. Do you eat foods with sugar alternatives in them or know people who do? Read the rest of the warning about sucralose. A Fresh New Vegan You got great feedback from the early readers. Even experienced vegans said it was a helpful resource that they would refer to often. You can learn more about it here. ONE DAY SPECIAL: I am running a one-day special for newsletter subscribers. Today only, take $6 off... a discount of 25%! If you already have your own copy, get one now for a friend who's on the fence about going vegan. I'm having a good time being vegan so far, but there are a lot of things I miss. Are peanut butter and jelly sandwiches vegan? I also miss the taste of fish... is there a way to make a tofu salad that tastes like tuna salad? This is going to sound strange, but I just want to get more creative with my tofu. Another thing, I've heard so many things about processed foods, isn't it a lot more expensive to buy organic? Also, what are the drawbacks of drinking soy milk, almond milk or any other kind of shelf milk? Also, what brand of vegan condiments like vegan cheese do you recommend and where can I get them from? I hate the veggie cheese at Safeway..it's not vegan at all because it has casein in it....help! Congratulations on going vegan! I hope you are loving it so far! You have a bunch of great questions, so let me try to answer each of them. PB&J should be vegan, but it depends on your ingredients-- just check to make sure there isn't anything hidden in your bread and jelly. For peanut butter I always just go with freshly ground peanuts, which usually are cheaper than the cans anyway, and it's always vegan. There are also tons of non-peanut nut butters available in markets nowadays, if you want to mix it up. There are a bunch of really good chickpea "tuna" sandwiches out there. It's pretty easy to make actually. You just smash the chickpeas, add a little kelp powder and then add anything you normally put into tuna sandwiches. Read the rest of the answer to Belle's question here. The biggest thing I missed as a new vegan was cheese. What about you? Have you found a substitute or do you still miss it? Submit your vegan questions here. When you ask and help answer other people's questions, others learn as well. This vegan pasta is the quintessentail summer dish for me. It's made with fresh tomatoes, basil, garlic, hot peppers, olive oil, and pasta. I love it! My mom used to make each of her kids their favorite meal for their birthday. For me, it was always Pasta la Caprese. I am a summer baby and I feel like I must have been connected to summer vegetables from birth. And garlic, of course! My mom insists that she shouldn't get credit for this dish and that she found it in some magazine years ago. I've never seen this mysterious recipe clipping, and I know she free-hands the dish, so I really think it's her dish. The "la Caprese" in the name comes from the island of Capri, outside of Naples, Italy. Check out how to make this simple, utterly delicious, pasta dish! All you have to do to enter is upload a picture of one of your favorite vegan recipes and give us tips about the dish. You are welcome to include the entire recipe if you like. You can also enter as many vegan recipes as you choose. Don't be intimidated, even if you are brand new at veganism.